When a few more teeth appear, you can start using toothpaste with your child's brush. 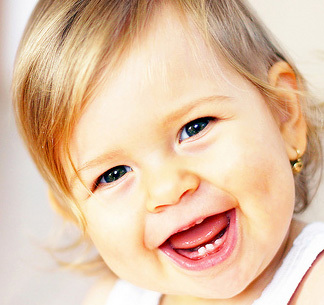 However, for the first two years, you may choose a toothpaste that does not contain fluoride, unless advised to do so by your dentist, because too much fluoride can be dangerous for youngsters. You may use a toothpaste with fluoride, just be sure to only use a very small 'smear' of toothpaste accross the top of the bristles. At this stage, use only a tiny amount of toothpaste. From the beginning, have your little one practice spitting the toothpaste out after brushing to minimize the amount of toothpaste that is swallowed.